Pull a spaghetti noodle out of a box of pasta and take a look. It's long and stiff. Try to bend it and it breaks. But fresh pasta is pliable. It can fold just like cooked noodles. When students first look at an amino acid sequence, a long string of confusing letters, they often think those letters are part of a chain like an uncooked spaghetti noodle. Stiff and unbending, with one end far from the other. Molecular modeling apps let us demonstrate that proteins are a bit more like fresh pasta. If we apply rainbow colors (Red Orange Yellow Blue Indigo Violet) to a protein chain, we can see how the chain is folded. 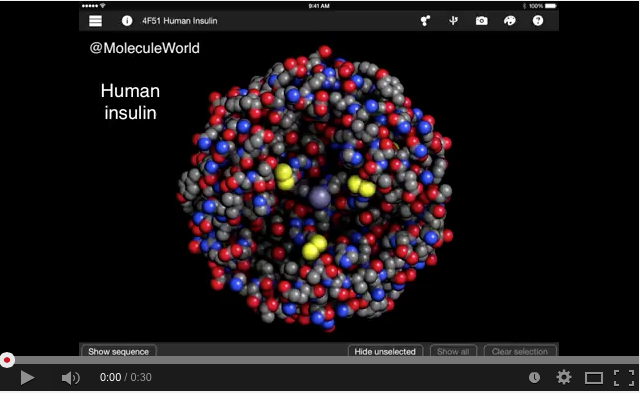 This short video shows how a molecular modeling app, the Molecule World iPad app can be used to make an image of a folded insulin peptide. Protein folding brings the amino acid at the beginning of the protein chain near the amino acid at the other end. The steps are: 1. Change to rainbow coloring to see the orientation of the protein chains. Rainbow coloring shows the protein chain in the colors of the rainbow (Red Orange Yellow Green Indigo Violet). 2. 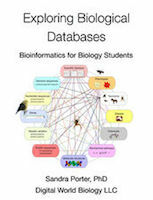 Show the amino acid sequences for the proteins. 3. Select one of the chains. 4. Hide the other chains. This makes it easier to focus on the way a single chain folds. 5. Change the drawing style to tubes. This makes it easier to see the overall orientation of the chain.